By Mark Weisbrot and Jake Johnston. Original article here. A draft copy of the Organization of American States (OAS) Report on Haiti’s election, “Organization of American States Expert Verification Mission, President Election — First Round 2010 — Final Report,”1 was leaked to the press last week, and the Center for Economic and Policy Research posted a copy on its website after receiving it from a different source. The report was formally presented to Haitian president Rene Préval on January 13. Media reports suggest that the final version given to Préval includes the same conclusions as the earlier, leaked document. The government of Haiti is currently under pressure to accept the recommendations of the report, which would change the result of the first round of the election. According to press reports, President Préval has expressed “reservations” about the report, including “the fact that six of the seven members of the OAS team came either from the United States, Canada or France, countries which had raised early public objections to the preliminary Haiti election results.”2 France is not a member of the OAS, but only has Permanent Observer status. For these reasons it is important to understand, as accurately as possible, what the Mission did and did not do, and how it arrived at its conclusions. Although parts of the report are unclear or ambiguous, and it is not always transparent about its methodology, it is possible to understand the most important aspects of the Mission’s analysis. We find that the Mission did not establish any legal, statistical, or other logical basis for its conclusions, i.e., that candidate Michel Martelly finished second and Jude Celestin third. The Mission appears to have first constructed a sample of the 11,181 tally sheets. (A tally sheet contains the vote totals for one voting booth.) The construction of this sample is complex, and not very clearly explained; the explanation is in Appendix IV of the commission’s report. However, since the Mission’s determination of the final vote count does not depend on a statistical inference from this sample, the report’s conclusions are not dependent on the details of how the sample was constructed. On the basis of these legal criteria, the Mission excluded 234 tally sheets. 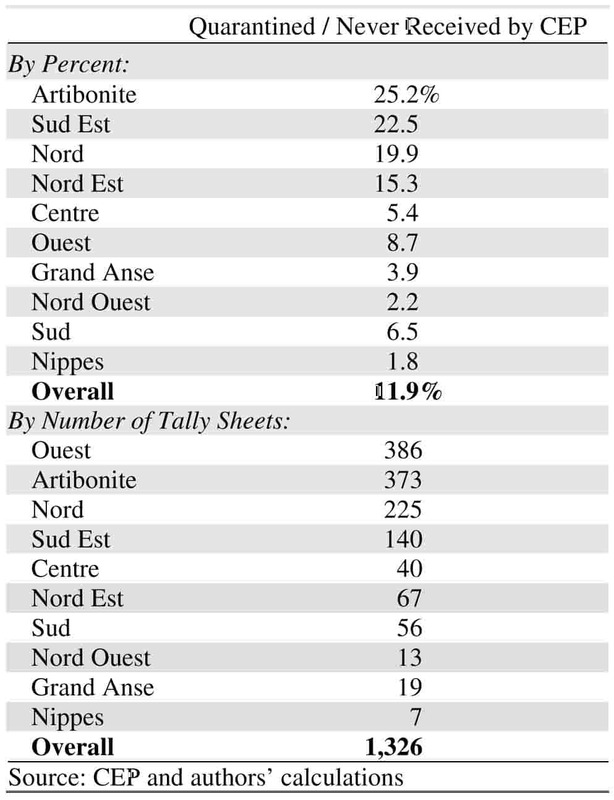 The exclusion of these tally sheets then changed the total votes for the three candidates: instead of 22.5 percent for Jude Celestin, and 21.8 percent for Michel Martelly, the result with these 234 tally sheets removed was changed to 22.2 percent for Martelly and 21.9 percent for Celestin, according to the report — a margin of 0.3 percent. Thus Michel Martelly, instead of Jude Celestin, would proceed to the runoff election, if these results were accepted. There are several things wrong with this methodology and result. (1) First, the mission reviewed only a subset of the 11,181 tally sheets. According to the report, this subset appears to be 919 tally sheets.7 This means that there are many more tally sheets that would be excluded under the four legal criteria applied. Even if the correlation between voter participation and irregularities is very strong, the subset examined cannot contain all of the tally sheets that would fail to meet the legal criteria applied by the Mission. In fact, with a sample of 919 tally sheets, it is quite possible that the majority of irregular tally sheets — by the four criteria used by the Mission — were outside of this sample.8 Since there is no statistical inference reported from the sample that was examined, we have no idea whether a different result would be obtained if all of the tally sheets were subjected to these four legal criteria. Of course, even if these four legal criteria had been applied to all 11,181 tally sheets, and all the ballot sheets that would be rejected according to these criteria were thrown out, this would not mean that we would have confidence in the result. This would constitute a statistical analysis or recount. Such a procedure would merely mean that all the tally sheets counted met certain selected legal criteria — the ones described above. But the four legal criteria were only applied to a small fraction of the tally sheets; so the Mission does not even have a limited legal basis for its result. shows the breakdown by department of these tally sheets. If the voters in the areas of missing/quarantined tally sheets had the same voting patterns as the overall distribution of votes in the country, then the Mission would at least be able to claim that the exclusion of these voters did not affect the result. However, the distribution of votes in the areas of missing/quarantined votes was indeed different from the rest of the country; it was significantly more pro-Celestin. In our previous report on this election, we did a simple estimate of the vote count for the missing/quarantined tally sheets based on the proportion of votes received in the areas that the tally sheets were from. On that basis, we found that Celestin came in second, with 22.6 percent of the vote to 21.2 percent for Martelly.11 The impact of the lost votes, based on the voting patterns of those areas, seems to far outweigh the impact of irregular votes. The Mission’s analysis does not provide any basis — statistical or otherwise — for changing the result of the first round of the presidential election. By throwing out 234 tally sheets and adding up the other 10,947, they can indeed get a different result — with Celestin finishing third by a very small margin: 0.3 percent of the vote, or about 3,200 votes. But this is a purely arbitrary result. It does not even apply the same legal criteria to all of the tally sheets, and hence there are likely hundreds of unexamined tally sheets that, by the four criteria used by the Mission, would also be thrown out. And most importantly the Mission failed to take into consideration the missing/quarantined tally sheets, which if they were not excluded, would likely have put Celestin in second place. There are many reasons for re-running this election: first, the turnout was amazingly small. Only about 27 percent of registered voters went to the polls — a record low for the Western Hemisphere, including Haiti, for more than 60 years. An even smaller percentage, 22.9 percent, had their votes counted. And disenfranchisement was even higher in those areas most affected by the earthquake, about half of the overall average. There were also a large amount of irregular vote totals, clerical errors, and of course the missing/quarantined vote total is very high. But regardless of what is done going forward, the Mission has failed to provide any sound basis for a credible vote count in the first round of the election. 2 Delva, Joseph and Tom Brown. 2011. “Haiti Leader Has ‘Reservations’ over OAS Report.” Reuters. January 13. 3 Agence France Presse quoted French foreign ministry spokesman Bernard Valero as saying, “Now it’s time to recognise the consequences of the definitive results of the first round of voting so that they reflect the choice expressed by voters.” Agence France Presse, “France Warns Haiti to Respect OAS Poll Report.” January 14, 2011. 4 We could not estimate turnout accurately for all of the voting booths, because the tally sheets posted online did not contain the exact number of registered voters for each booth; presumably the Mission had access to the actual number of registered voters. 8 The report does not tell us what the size of the correlation is between its selection criteria (50 percent or greater with a single candidate receiving 150 votes or more) and its criteria for rejecting the selected tally sheet, listed above. 9 The Associated Press cited the Assistant Secretary General of the OAS, Albert Ramdin, reporting that: “Nearly 4 percent of polling place tally sheets used to calculate the results were thrown out for alleged fraud at the tabulation center, Ramdin said,” in Katz, Jonathan. 2010. “Haiti Election Results Could Be Delayed for Weeks.” Associated Press. 18 December. 10 The OAS report found that 1,357 tally sheets were quarantined or not received by the CEP. 11 Our tally also excluded tally sheets that our statistical analysis found to be irregular; but these favored Celestin. Mark Weisbrot is an economist and Co-Director of the Center for Economic and Policy Research in Washington, D.C. Jake Johnston is a Research Assistant at CEPR. This article was first published by CEPR in January 2011 under a Creative Commons license.